I know that I’m a slug sometimes. I take full responsibility for that. I’ve even developed a sort of pride in my slugdom. If I’m going to be a slug, be a very good slug. Read a book all day and nothing else except for food and bathroom breaks. THAT”S a slug in action…you should excuse the mixed metaphor. But, I haven’t really been a slug this week, yet I feel like one. I did some, admittedly not much, but some reorganizing of my closet area in expectation of putting in a new clothes hanging rack. Of course, that has to be assembled, but one step at a time! I’ve started to work on cleaning out my car which is more like a mobile storage unit, but still does transportation duty. 😉 I believe I’ve removed all of the legitimate trash from the car. I found 4 rain coats and 4 umbrellas…guess I’m Really worried about the rain! Oh, yes, also a rain poncho that Ralph put in …Just In Case!! There is still an entire box of rummage sale/yard sale/Goodwill household finds that I want for our house in New Mexico. If I had done this before the trip in August, I could have taken them all there and wouldn’t have to worry about them now! There’s also a box filled with books. Some came from Florida after my trip in January. I didn’t actually get them until April when Gail drove back. Others again are rummage sale/yard sale/Goodwill treasures. Some though are destined for My yard sale in the Spring. Thank goodness! Also found a bag full of CD’s that I used to listen to in my office to sooth me when people were driving me crazy. I had no idea where they were and I was glad to find them. At least I no longer have the urn with my ex-father-in-law’s ashes back there. I was given custody for various reasons too long and complicated to go into. He rode with me for quite a while until we figured out what to do with him. I thought of him as my guardian angel on my long commute. I would talk to him sometimes. He received his proper burial about 2 years ago. I miss his comforting presence back there. The car is probably going into the shop today, so I need to get more of my treasures out of there. The day that Ralph and I spoke to the mechanic about getting the car fixed we stopped at Taco Bell for lunch. I had their veggie cantina bowl. This was really good. Fairly high in points, but it was tasty enough to be worth it! Last night, I was hungry but again playing the part of the slug. I made cous cous spiced with Mrs. Dash Fiesta Lime. That’s not much work…In the microwave, I heated some of my crock pot black beans (it’s so great when they are waiting in the fridge for me! 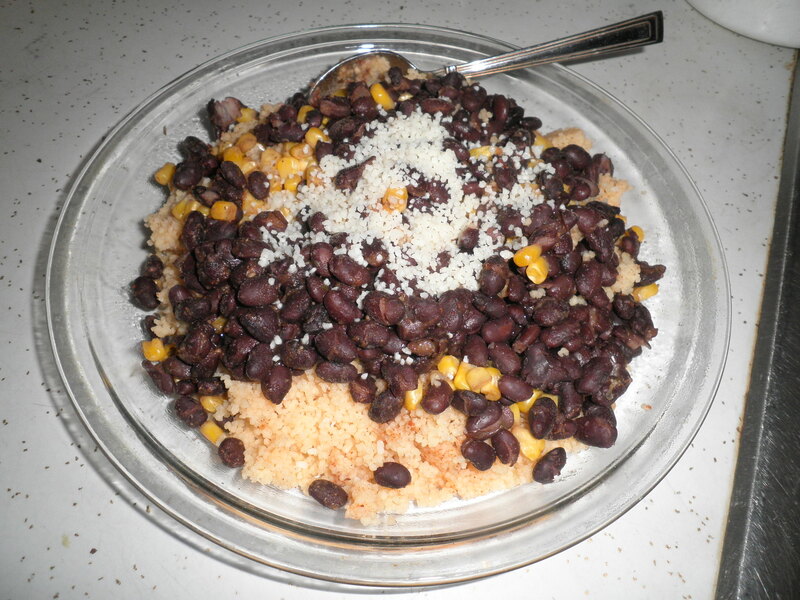 ), some frozen corn, some veggie broth and lots of Penzey’s Arizona Dreaming seasoning. Topped it with some Locatelli cheese and in about 8 minutes…dinner was served! It doesn’t look all that appetizing (a lot of times I think that about my food!) but trust me it was delicious! So I guess, if you total it all up, I haven’t been a slug. Just can’t figure out why I feel that way. Oh, well…Guess I just need to make every day productive whether it feels that way or not!! 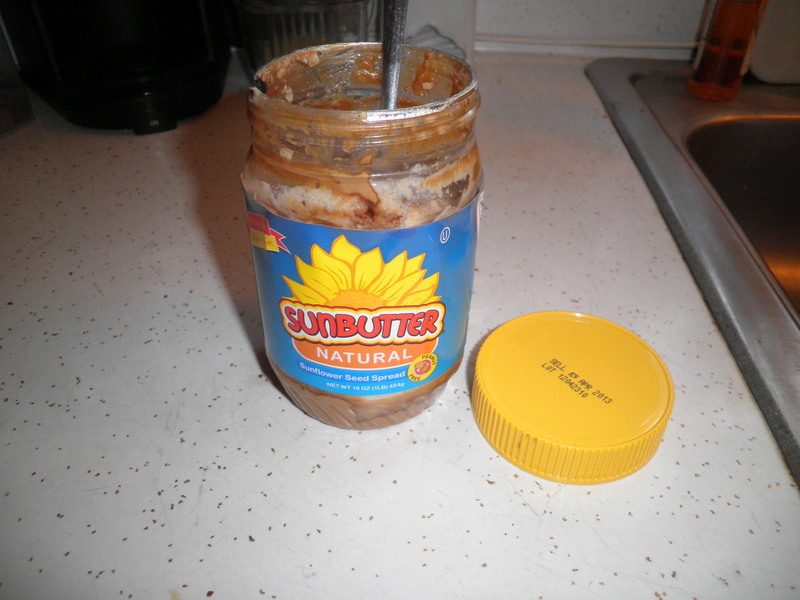 This entry was posted in Uncategorized and tagged books, salads, sorting and packing, veggies, Weight Watchers. Bookmark the permalink. after yesterday you have two more raincoats to add toyour collection! Oh, Lord! I forgot about that…Yikes!! fun to read about all the “treasures” you located, fran! i could actually use another umbrella…!! that story about the ex-father-in-law’s urn … very interesting and i wish we could go for coffee and i could hear more! I would love to tell you the story, Cathy. Maybe I’ll e-mail it to you! Have a great day! I love this. I’m a slug too. 🙂 We do the best we can! Oh, you might enjoy my latest post…30 lunches for 30 days. I pack for my husband, and we’re trying to eat healthier these days. Mare, glad I’m not alone!! I’ll go read it right now…take care! It does sound like you’re getting things done! And haha, my dad is a car guy and maybe or maybe not jokingly requested that his ashes be put in a car so he can keep driving around. That bowl’s from Taco Bell?? 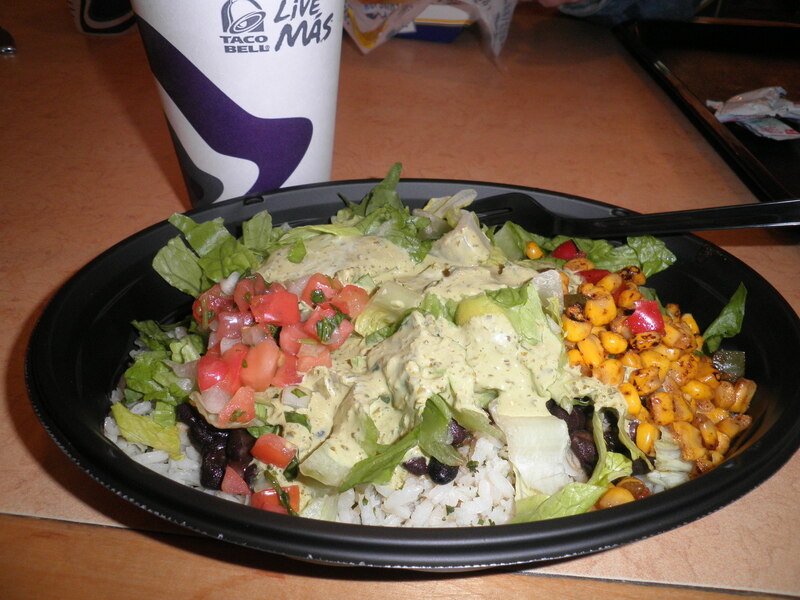 Looks delicious–I never even think about Taco Bell as an option for quick food. Allie, the salad is delicous! Give it a try! You’re Dad sounds like a fun guy! I like it! Sometimes it’s great to be a slug and just read books! I’ve done less of that since I started blogging (but maybe that’s just a different type of slug-like behavior)! Happy Thurs! Stacie, I think the slug-ness is somehow ingrained in me! I keep fighting it though! I so know what you mean about your car being a storage area! Umbrellas love my car too. No shame in being a slug, sounds like the perfect life hehe. Can’t go wrong with a good book. Thanks, Anna! I’m glad my habits are not too frightening to other people!! 4 rainjackets and umbrellas!!!! That has got to be a record. I bought a few umbrellas when my kids were younger but they played with them when it wasn’t raining and broke them all, so I said “no more umbrellas”. It doesn’t rain much here and even when it does I’d rather get wet than deal with a wet umbrella. It’s somewhat lazy. Marie, I agree, umbrellas are a pain. I have a rain jacket (that was NOT in the car) with a hood that is really the best choice. keeps my head dry, has big pockets so I don’t have to carry a purse on a rainy day…but I’ve worn it so much the sleeves are fraying and the pocket is torn. It’s my favorite…and we know how we get about our favorites! Your dinner looks and sounds delicious. I love couscous too. A day with nothing but a book and some food sounds like a dream come true. Hi Meghan! Yes, that would be enough for me, too. Glad you like my dinner. I like simple and you can’t get mush more simple than couscous!